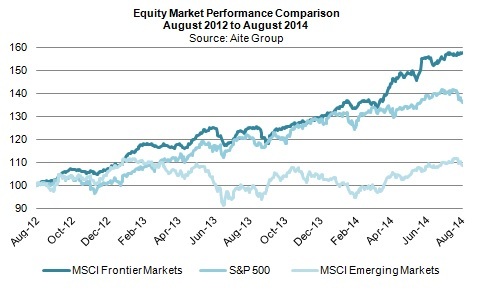 Frontier markets―an attractive equity market destination for investors looking beyond emerging markets. Boston, September 24, 2014 – Since emerging markets fell into a sustained slump in 2011, frontier markets have become an increasingly popular investment destination for adventurous portfolio managers. Frontier markets remain miniscule in size and liquidity compared to the more developed emerging markets, so what is driving their popularity among the less risk averse? And do these markets have staying power? This Aite Group Impact Note provides an overview of the frontier markets as an investment class, including analysis of macroeconomic and financial market characteristics. This 23-page Impact Note contains 13 figures and four tables. Clients of Aite Group's Institutional Securities & Investments service can download this report.